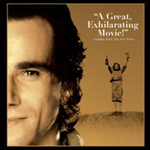 Daniel Day-Lewis is a great actor. That fact was brought to the world’s attention in 1989, with the release of Jim Sheridan’s (In America) feature debut, My Left Foot. Day-Lewis took home the Oscar for his portrayal of Christy Brown, a man with cerebral palsy who learned to paint and write with his left foot. The movie begins in Christy’s childhood (played at this age by Hugh O’Conor), when his parents and many brothers and sisters assumed that he was mentally retarded. Cerebral palsy affects the motor functions, not the cognitive functions, but in a poor Irish neighborhood in the 1930s, it was probably easy to assume the worst. Sheridan takes us through Christy’s first emergence from the fog to the day he meets his wife. In-between is a life of moral victories — Christy’s own show at an art gallery, the publication of his memoirs — but also a life of great loneliness softened by the devoted love of his mother (Brenda Fricker, who also won an Oscar for her performance). My Left Foot is not a perfect movie. Elmer Bernstein overscores the drama and Sheridan overplays the comic relief. But the core of the movie is Day-Lewis’ performance, which is above reproach. The best extra feature is sappily called An Inspirational Journey: the Making of My Left Foot. It’s a piece edited together from interviews with the producer, the screenwriter, and a couple of Irish film critics. It’s not much to look at, but it tells some great stories. Day-Lewis, for example, threw himself into the role. He wouldn’t break character during the shoot, even during lunch, having to be fed by an assistant. Even when an important producer came to the set, Day-Lewis remained Christy Brown. One interviewee recalls that Day-Lewis broke a couple of ribs in his physically taxing performance. It’s also interesting to note that the producer, Noel Pearson, never thought the movie would play outside of Ireland. But Harvey Weinstein was at the Dublin Film Festival that year and brought it to America. Another featurette has the same subjects discussing the real Christy Brown. There is also a stills gallery, with what appear to be freeze frames taken from the movie. And finally, there are some reviews from 1989. The most notable of these is from Pauline Kael, who hardly ever writes favorably about a movie, praising the film and Day-Lewis’ performance. This “Collector’s Series” DVD has remastered picture and sound. Amazon.com says the picture and sound are much better than the previous DVD release, which I have not seen. That’s a little surprising, because although the picture quality is good, there are times, particularly over the opening titles, when the film is very dirty; there are small, stationary black spots of dirt. Because they are stationary, it’s probably not the print that is dirty, but the source material. It doesn’t lessen the impact of the movie, but in this age of bit-perfect digital video, it’s a little surprising to see something less than pristine. Sound quality is also good, on the whole. The score sometimes overwhelms the dialogue and sound effects, but it could be that the source material just isn’t sophisticated enough to allow a more subtle mix.